From Hot Mess to Heavenly Masterpiece! As fall and winter seasons approach, I love to bring out all the holiday recipe books! This time of year I stock up on all the baking staples such as flour, sugar, brown sugar, pumpkin pie spice and cream cheese. Have you ever wondered how all of these items placed in a bowl, combined together by a couple of metal beaters can make such a tasty and beautiful creation? Think about a cake for example. You place flour, sugar, butter, eggs, vanilla, baking powder, salt and a flavor additive such as pumpkin or cocoa in a bowl. When all of that is mixed together, it just looks like a big fat mess. But then you put it in the oven and somehow the messy mixture together with the heat of the oven creates this masterpiece! Amazing! As hard as it is to imagine while we are going through rough times and the heat of this life, God is creating us into beautiful masterpieces. 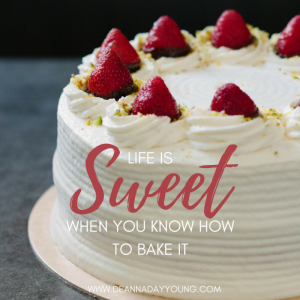 When baking a cake, it won’t turn out right if the temperature is incorrect – just like our creation as a person. Sometimes we look at our trials and wonder why we have to go through so much heat. But no matter what our temperature of trials, God will use it to make us the perfect Masterpiece He created. His recipe for you includes different ingredients in life than for me. Neither are better or worse. They are just the recipe that mixed all together makes us the unique creation we were designed to be. And my friend, you look amazing! This entry was posted in Uncategorized on October 20, 2017 by Deanna Young.